There'll be no review of 2018 or goals for 2019 from me. I did so little craft last year, I can barely believe it. I would like to craft more this year, but I'm not putting any pressure on myself, so I'll make what I make and post when I post! I finished this necklace before Christmas. I've shown you peeks of me making it. In this post from March last year, I showed you a bit of the technique! 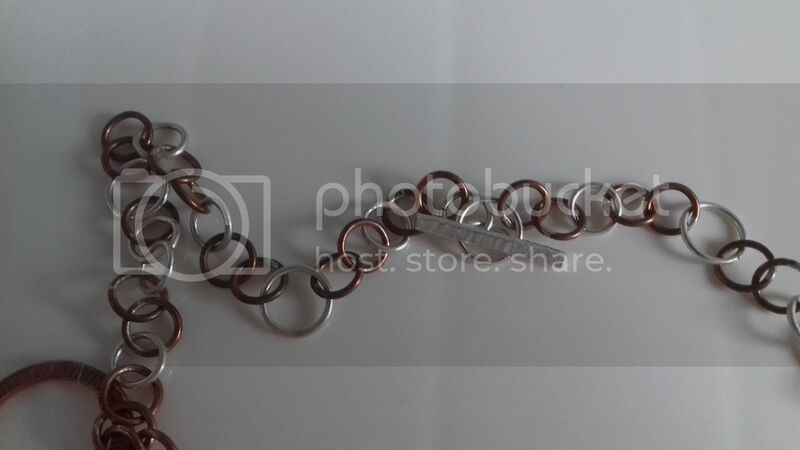 Making soldered chain IS a time-consuming process, but I'm also quite slow and made various other things at the same time! It's made from copper and sterling silver. I made large jump rings, soldered them and cleaned them up, then rolled them through the rolling mill to flatten them. They were then hammered to add texture. 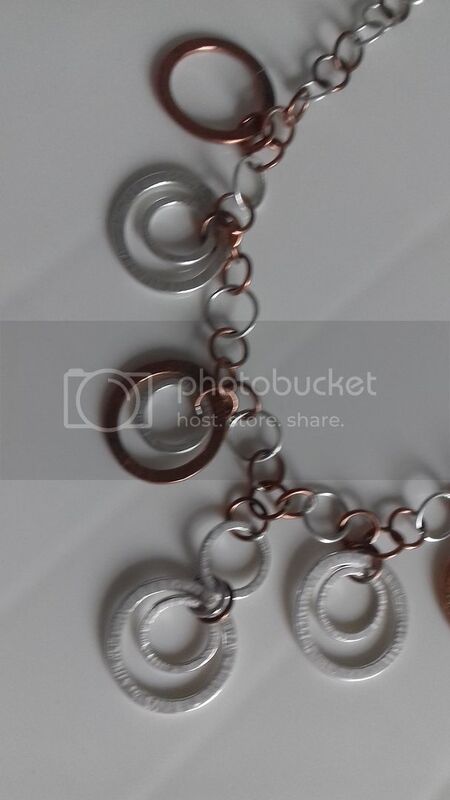 I then made what felt like about a gazillion small jump rings and soldered it all together. I then spent a LONG time filing and sanding each and every link! It is finished with a hand made and hammered toggle clasp. I love it. I love mixed metal jewellery and I love rings like this. I'm not sure I'd embark on making another chain from scratch though! That looks great! I have made many chain items, but I never soldered them! That looks entirely too time consuming, but the end result is amazing! This is an interesting piece of jewellery. I really like the texture of the rings. I can't imagine how long it took to file and sand each link! Have you worn it yet? Well done indeed - and very wise not to put pressure on yourself. It's been a trying couple of years, and 2019 looks like being "interesting" for all of us! All the best for 2019, and I’m taking your approach to both 2018 and 2019! I’m hoping to embroider and blog more, fingers crossed! 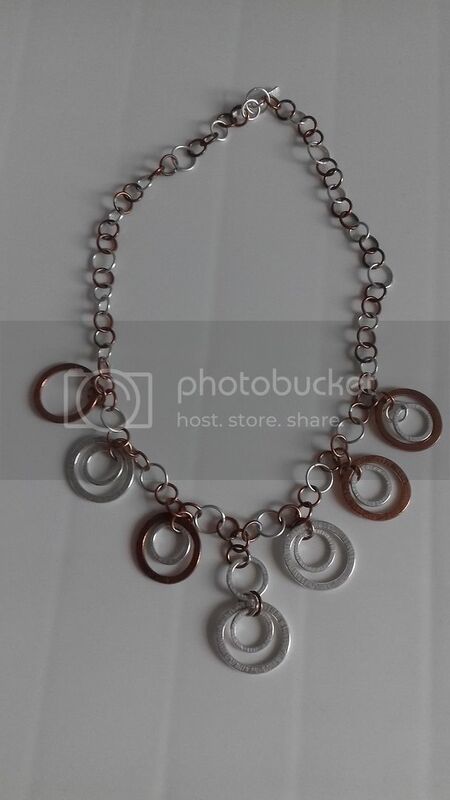 This is a really lovely necklace. It is worth the time it took to make it! I can imagine it was incredibly time consuming but well worth the effort! Love your necklace! You did a great job. It's lovely and having done some silversmithing I can really appreciate how long it took to end up looking this amazing! I want to see a picture of you wearing it so I can see how long it is! That's an amazing necklace and you deserve a lot of credit for the painstaking work. This is absolutely gorgeous, what a lot of time and effort! It looks lovely. I can see why it has taken so long. So much work!! Great finish. Catching up after a long blogging absence and I love your chain. I admire your perseverance considering the time it would have taken but now you have a beautiful piece of jewellery that is individual. Love the necklace. Things with mixed colors/metals are so versatile vs only silver or only gold etc. I like your idea of no goals...just go for it. Wow - I can't imagine the work involved. Looks stunning!